I love weddings! 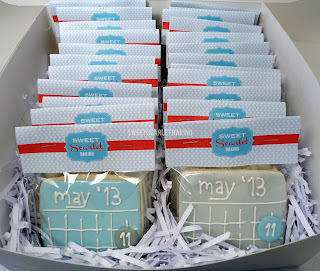 What better way to tell people about your special day than with cookies. 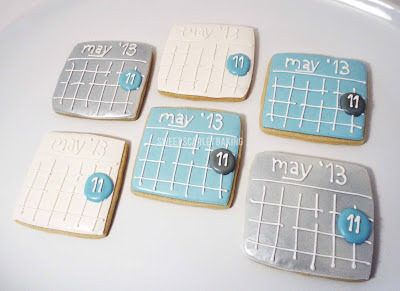 My customer asked me to make "Save the Date" decorated sugar cookies for a bridal shower based on this design by Flour Pot Cookies. I have never decorated with silver icing before, so this was really fun. The silver cookie actually started out just like the white cookie, but then I sprayed it with this silver lustre spray from Wilton. It did not change the taste of the cookie and looked fabulous. These cookies went home with the bridal shower guests as party favors. and mail them to your out of town wedding guests.